Ch 2. A Little Theory for Weather Flying. Ch 3. Some Thoughts on Checking Weather. Ch 4. How to Check Weather. Ch 6. Checking Weather Details. Ch 7. Checking Weather for the Route. Ch 8. Equipment Needs for Weather Flying. Ch 9. Temperature, an Important Part of Weather Flying. Ch 10. 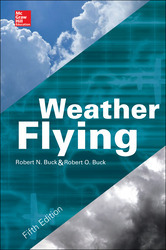 Some Psychology of Weather Flying. Ch 11. Turbulence and Flying It. Ch 12. VFR Flying Weather Visually. Ch 13. About Keeping Proficient Flying Instruments. Ch 14. Thunderstorms and Flying Them. Ch 15. Ice and Flying It. Ch 16. Taking Off in Bad Weather. Ch 17. Weather Flying En Route. Ch 18. Landing in Bad Weather. Ch 19. Teaching Yourself to Fly Weather. Ch 20. Something on Judgment.